Nerve Entrapment is a condition in which the nerve passing through confined spaces are pressed upon. Radiculopathy is a term used to describe a nerve not functioning properly. The Nerve entrapment manifests with pain of the nerves or with a loss of function in the muscles they innervate (supply). 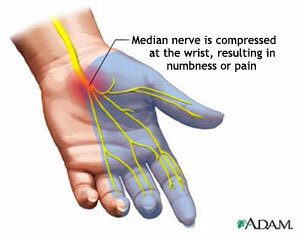 There are several types of nerve entrapment syndrome, commonly known as Carpal Tunnel Syndrome, Thoracic Outlet Syndrome and cubital tunnel syndrome. Nerve Entrapment are generally caused by repetitive stress and/or activities. Treatment will initially focus on reducing the compression of the nerve to help reduce the symptoms, specifically pain and swelling. Once compression is eased circulation will improve and exercises can be used to stabilize the muscles surrounding the nerve structures. Radiculopathy is any disease of spinal roots and spinal nerves. Radiculopathy is characterized by pain that seems to radiate from the spine and extending outward to cause symptoms away from the source of spinal nerve root irritation. The result can be pain or radiating pain, numbness or difficulty controlling specific muscles. There are several types of radiculopathy such as lumbar radiculopathy (may refer pain as sciatica), cervical radiculopathy, thoracic radiculopathy and piriformis syndrome. The treatment for radiculopathy would primarily focus on reducing the compression of the nerve. Once compression has been alleviated symptoms should diminish and pain should be reduced. This should also help improve nerve root function. Exercise to strengthen affected muscles or to help correct poor posture that may have contributed to the nerve compression can be helpful. 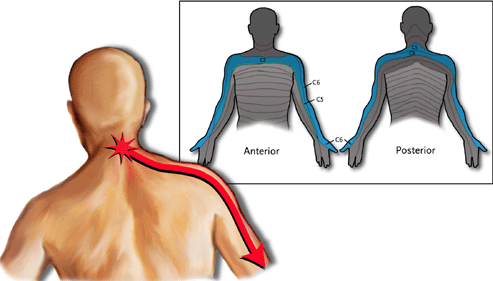 Thoracic Outlet Syndrome is a condition that involves the compression of the brachial plexus (the nerves of the neck/shoulder) and the accompanying artery between muscles of the neck, close to the shoulder or clavicle. 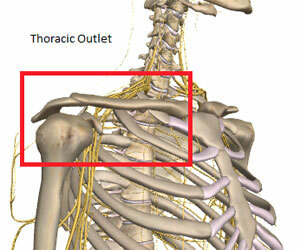 Thoracic Outlet Syndrome can present and overlap other conditions such as Carpal Tunnel Syndrome. Treatment would focus on removing or reducing the compression of the affected nerve. By reducing or removing the compression of the nerve the symptoms of Thoracic Outlet Syndrome such as pain, sensory reception and muscle control should all improve. Reduced pain, improved sensory reception and improved muscle control are a result. Exercises to strengthen postural muscles and education regarding positioning which may have affected the condition. If you have any questions about Radiculopathy, Nerve Entrapments or Thoracic Outlet Syndrome contact our staff at Dynamic Physiotherapy.